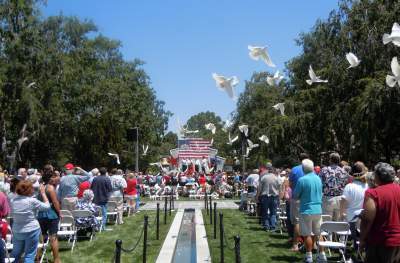 SANTA ANA, Calif. – May 14, 2013 – Fairhaven Memorial Park will host one of Orange County’s largest Memorial Day events on Monday, May 27 at 10:30 a.m. The event, entitled “The Spirit of Freedom,” is expected to bring more than 3,500 people together to honor the brave men and women who valiantly served our nation. This year will mark Fairhaven’s 21st Annual Memorial Day celebration and will include a star-spangled day of festivities featuring an aerial flyover, live music, inspiring military speakers, a visit from a real bald eagle and a host of other fun and patriotic activities. Patriotic speakers will include Colonel Peter Kim, U.S. Army, Lieutenant Colonel Donald P. Moriarty, U.S. Army Retired and Chaplain (Commander) George Fessler, U.S. Navy Chaplain Corps. Guests can enjoy complimentary hot dogs and refreshments throughout the day, and festivities will conclude with the posting of colors. Founded in 1911, Fairhaven Memorial Park is Orange County’s most beautiful independently owned and operated full service mortuary, crematory and cemetery. Fairhaven offers a wide range of pre-need and at-need services provided with care and compassion. Fairhaven is dedicated to celebrating the individual, providing services that are as unique and wide-ranging as the people they celebrate. Additional information is available at www.fairhavenmemorial.com.